Ronnie Guffey stared down an official during the 2005 Sweet 16 semi-final game against Paducah-Tilghman. That 71-56 Clinton County victory was Guffey’s last win as a head coach. One of the best known and most well-liked figures from the world of Clinton County High School athletics, Ronnie Guffey, died suddenly last week, at his home in Murray, Kentucky. Guffey had been mowing the lawn at this Murray,Kentucky home, when he collapsed after apparently suffering a massive heart attack. He was pronounced dead at a Murray hospital. Guffey spent two stints as head coach of the Lady Bulldogs, 1989-1998 and again from 2004-2005, as well as a span as head coach of the Bulldogs from 1998-2001. Even during the time he was not the head coach of the Lady Bulldogs, he continued to sit on the bench, working as an assistant coach to then head coach Gary Abbot. While coaching the Lady Bulldogs, he compiled a 12 season overall record of 183-168, winning five 16th District Championships in 1989, 1990, 1991, 1993 and 2005, as well as three district runner-up titles in 1997, 1998 and 2004. He also won four 4th Region All “A” Classic titles in 1990, 1998, 2004 and 2005 and one All “A” Classic State Championship in 2004 and a runner-up title in that same state tournament in 2005. Guffey coached his 2005 Lady Bulldog team to the 4th Region Tournament Championship and that same year, took the Lady Bulldogs to the KHSAA Sweet 16 championship game, losing to Lexington Catholic in a down-to the wire contest, but earning the KHSAA Runner-up title. 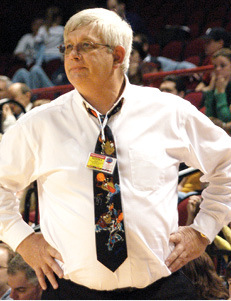 Guffey was inducted into the Kentucky Association of Basketball Coaches Court of Honor in 2005. While coaching the Bulldogs, from 1998-2001, he compiled a four-season overall record of 69 wins and 44 losses, and during that time he earned the 16th District Championship in 2000, the 16th District runner-up title in 1999 as well as two 4th Region All “A” Classic runner-up titles in 1999 and 2000. He was the 4th Region Coach of the Year in 2000 and the Fellowship of Christian Athletes Coach of the Year in 1998. In addition to serving as head coach of both the Lady Bulldogs and Bulldogs, Guffey was also Athletic Director at Clinton County High School. He retired from teaching in 2005. After being instrumental in establishing the Clinton County High School Wall of Fame in 1998, Guffey himself was honored as an inductee onto the WOF in 2011. A complete death notice for Ronnie Guffey appears this week on page 4.